I’ve been using Facebook for 12 years. When I was making my profile I remember being unsure about the utility of adding people I already knew on a new platform. At the time it seemed like a trivial thing. Years later, I’ve experienced the benefits and been weight down by the consequences of relying on Facebook for my social interactions. Facebook allowed seamless sharing of any aspect of your life with your friends and the world. You were able to easily organize events, share your thoughts, post your pictures, and keep up with an ever expanding social circle. It was easy to connect with people you met at a party or saw doing something that interested you. In sharing with the world you were able to quickly make connections and find like minded people. The event planning ability of Facebook was always what I enjoyed the most. You could promote an event to your friend group and beyond. You could see what your friends were up to and join in. You could browse events happening around you and find new friends. Being able to share photos of the event after allowed everyone to hold on to the memories longer and stronger. It was a fanatics tool. But there is a price to pay for a free service that knows all us better than we know ourselves. In 2012, Facebook became a publicly traded company. The IPO put the valuation of Facebook at over $100 billion dollars. At the time, I couldn’t imagine what would make Facebook that valuable. Today it’s worth over $500 billion. They have made their money in selling the private details of their users. Facebook is a propaganda juggernaut that has been involved in scandal after scandal. Facebook is still a meeting place, but it’s using everything to say for their own profit. They are selling the sociological model of you to the highest bidder. Personal data gathered over decades is being used to manipulate us to act against our own interests. We are the product Facebook is selling, and they are selling our free will. Social media has become a necessity of modern life. No longer is it a fun way to stay connected, rather it’s a personal brand that needs to be maintained. Your peers, co-workers, clients, and finical institutions use your social media to judge you. In China they have gone full blown 1984 and created Social Credit System. Science fiction from 2016 is now a real. The effort of maintaining an online presences while balancing work and play means that you can never be switched off. I came across an article that explains the emotional labour and burnout facing Millennials. I highly recommend reading it in it’s entirety. We are constantly working, being watched, and being judged on what we do. It’s absolutely exhausting. The effort of maintaining a presence on Facebook is no longer worth all the drawbacks. It’s a chore that I no longer want. Facebook allowed us to extend our social circle far and wide. I’ve directly benefited from that. I’ve connected with people around the world and had experiences that would have never happened without social media. Although my relationships have gone wide, they have not gone deep. In this vast world of infinite possibilities, we are more disconnected than ever. Going wide isn’t making me happy. Facebook wasn’t improving my life, it was just taking up brain space. After 12 years it had become second nature to me to always be on it. I’m braking that habit. I’m going to focus on going deep. I have deleted my Facebook profile. A business man boards a rocket to travel across the world in a matter of hours. An artist books a zero g flight to shoot a music video. A middle manager saves up her vacation money to see the curvature of the Earth. At some point in the very near future, regular citizens will begin to travel in space for pleasure and business. This will create new business, ideas, technologies, and public opinions about who we are as a people. Once space travel is open to the average person, we will see incredible change in our society. Canada needs to have a role to play in this new frontier. It’s not quite clear what that is yet. If we want to be a part of this future, we need to start planning for it. How does Canada’s international role change with public access to space? How does Canada bridge the gap between today and our desired future? What expectations do Canadian youth have of space professionals to bring about this change? What role do you see Canada playing? A paper published in Science presents the data used to determine the existence of an underground Martian lake. The scientists took information from the radar instrument aboard the ESA Mars Express between May 2012 and December 2015 and came to the conclusion that there is a body of salty water under the south pole of Mars. If this is indeed liquid water, it would have to be extreamly salty to be a liquid at the Marian poles. I don’t think it’s going to be a hostile zombie parasite like the movies. I’d settle for something harmless. This past week, Gwynne Shotwell spoke to the TED audience in Vancouver. At the end of her talk she said she believed SpaceX would be sending people to Mars within a decade. Elon is known for his super aggressive timelines, and Gwynne is the one usually reeling them in. If she says 10 years, that’s a whole different ball game. Mars is closer than it’s ever been. Below is the TED Talk video. It’s well worth the watch. It’s been three weeks since I’ve returned to “Earth” from my adventures at the Mars Desert Research Station (MDRS) I’ve spoken to many people about my mission there, and I’ve had some time to internalize my own thoughts and feelings. It’s be the digestion of those feelings that have taken up a lot of my head space recently and I wanted to share those thoughts with you. Writing things down have a way of clarifying my internal monologue. Being on a mission at The MDRS has been a goal of mine for years. I’ve read articles about the missions and read the biographies of those who have gone. I idolized those individuals who had the opportunity to participate in a Martian Analogue mission. I’m still processing what it means to counted among the people who I’ve sought to be with for so long. This introspective change has been difficult, especially when viewed through the lens of my experience. In essence I am now the expert I wanted to become, and I have to define what that means to me. The crew was by far the best part of my experience. It is always a joy to spend time with those who share your passion and make an effort to enable you in your own endeavors. I constantly suffer from impostor syndrome and it was amplified by this exemplary crew. Not only was the crew extremely capable, but they were a joy to work with. Listening to their stories and learning from their experiences was the most valuable part of the mission for me. I had never met any of them before the mission, so I was a bit anxious as to how our interactions would pan out. My flight was delayed, and I arrived at the hotel at around 2am. We had two rooms, a boys room and a girls room. Ryan, our commander, had texted me the room number and had gone to sleep. Passing out. I’ll get up to open the door when you knock. You can crash in the 1st bed with me I don’t care. Right away, I knew I had found my people. They were all about the mission and doing what needs to be done. Those who are squeamish or shy won’t last long in a Mars simulation, let alone an actual mission. Knowing that put me at ease. The crew quickly grew into a small family. In our small space, we had to interact directly with one another and rapidly became accustomed to each other. Over a dinner of freeze dried meats and veg with rice we would discus space policy, international cooperation, our local Mars advocacy efforts, and who just farted. We became like siblings and that provided the opportunity to communicate openly and vulnerably with each other. This allowed us to really understand each other and operate more efficiently. Touch became an important communication tool as a necessity; a tool that is absent from a normal working space. You had to put a hand on someone back to let them know you were behind reaching for a dish, or helping someone buckle their EVA suit up. This way of operating reminded my of time in the military, where you trusted those around you, and relied on them for your survival. It’s a good feeling. Going out in the field was a surreal experience. In the simulation, you can’t go outside unless you are wearing an EVA suit. These are backpacks with helmets that are used to simulate a space suit when you are outside. They provide a small amount of airflow to remove C02 and condensation in the helmet. They also have the distinct effect of removing you from the environment. When you are in an EVA suit, you can’t feel the wind, you can’t hear very well, and you have limited vision. The bulky back back restricts your movement and changes your center of gravity. Your sense are telling you that you are in an alien environment. You can begin to change your cognitive frame of reference, and you begin to believe you are on Mars. This is important, because then you start to internalize your own feelings about being on Mars. You know it’s fake, but what if it wasn’t? That’s the question you start to answer by imagining yourself there, and analyzing your feelings. I was on Mars. I was there with an amazing crew. I was waking up every day with the singular purpose of exploring, and maintaining the infrastructure to continue to explore. It was an invigorating feeling, and I can’t wait to feel that way again. The facility is of course, not on Mars. We didn’t have real suits, the air wasn’t actually toxic, and the Hab couldn’t actually fly though space and land on Mars. The preparation to go outside was actually less than working on an Oil Sands site in the winter time. While I knew the infrastructure would be far from mission ready, it was disheartening to see there was no actual flight hardware or system monitoring that would add to the realism of the simulation. 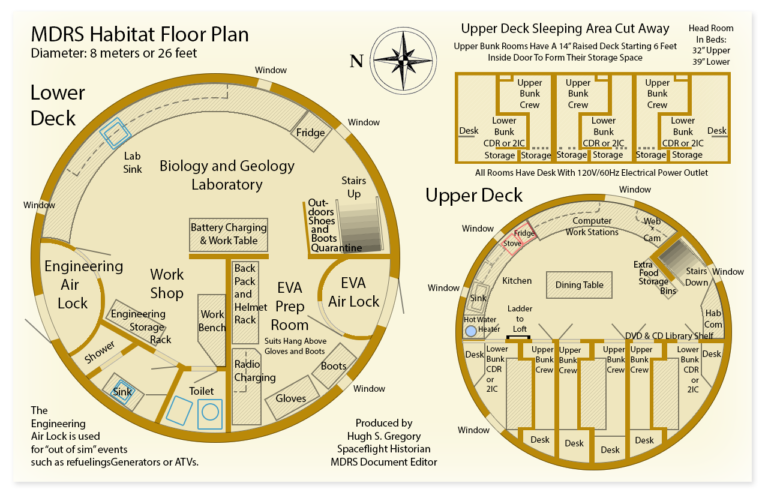 Reading past reports, it was clear that the functionality of the MDRS has declined in the past decade. It felt like I was meeting my heroes, and they had flaws I didn’t even consider. Radio communication in the field has a very short range due to the terrain. The repeater broke, and has not been replaced. Water consumption is monitored by eyeballing the tank level, and could easily be automated. The same with energy consumption. The greenhouse could be optimized to provide salads and herbs to the crew. The EVA suits already have a large 12V battery in them, and the suits could be outfitted with location and crew health sensors. Solar Power: Control not setup, Generator to be turned on manually when dusk approaches. Water Tank: Visually check tank, manually turn switch to fill. Furnace: Household thermostat, do not touch. Hot Water Heater: Propane on demand, do not touch. No automation, and very little opperunity to do data collection. No way to build infrastructure knowledge in order to increase the depth of the simulation for future missions. As I’ve generally found in my life, really ugly problems come from systemic issues. I only had limited exposure to the management of the MDRS, but I believe the lack of technical expertise dealing with the MDRS on a day to day and mission to mission basis is accelerating the deterioration of the facility. Myself and the crew got into several disagreements with Mission Support during the mission around technical issues. The crews that usually occupies MDRS are around the Undergrad level, and my fear is that they just do what they are told. This would create many of the unsafe conditions that I found, and there could be many more. When Crew 188 began investigating the infrastructure of MDRS, we got push back from Mission Support. The 1000 gal propane tank gauge is a percent gauge, but Mission Support is reading it in PSI. This creates confusion and a misunderstanding of how much fuel is left. I found several damaged extension cords, including one that had their grounding plug cut. I suggested moving the electric ATV’s to a location that would not require backing up when leaving the Hab, but this was overruled. These minor issues display a misunderstanding of technical safety that could result in a serious incident at the MDRS, and that is extremely worrisome. During the MDRS 188 mission there was a propane leak in the Hab, causing a direct risk to our crew. The leak was never fully investigated during our stay, and Mission Support’s concern over this issue varied wildly depending who we were talking to. The responses from Mission Support swung from “evacuate immediately” to “you are imagining things”. It became clear there were no established procedures or technical manuals to follow in a situation like this. If there had been proper monitors and automatic systems in place, this issue would have been caught long before it became a risk to the crew. 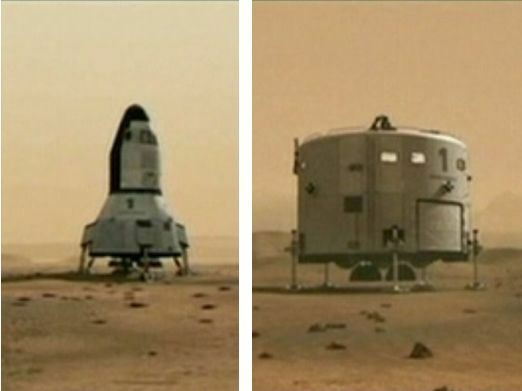 Unfortunately, adding on that capability to the MDRS does not seem to be a priority. Analog missions are dangerous. The crew is isolated and stressed. They are in an unfamiliar environment and require proper technical support to be effective and safe. This will be a critical part of Martian analog missions as the complexity grows. Crew safety will become more and more important as the analog missions become more complex. Not long after our mission, there was an incident at the HI-SEAS where an accident halted the mission. Safety concerns aren’t limited to the MDRS. This is an issue that all analogue sites need to deal with. I am very happy that I was able to be a part of MDRS 188. I was able to meet outstanding people who share my passion for Mars and space exploration. The relationships that were forged have strengthened my resolve and widened my Mars community. I’m looking at the negative parts of my experience as an opportunity to grow. Getting to Mars is going to take a lot of people and a lot of effort, and we need to start working together if we are ever going to achieve our goals. Later this week I will be flying to the Utah desert to be a part of the Mars Desert Research Station Crew 188. I am very excited, as being a crew member of MDRS has been a goal of mine for many years. For many of those years I didn’t think it would be possible, that little old me would get to go on such an adventure. I’m very happy to have exceeded my expectation. About 10 months ago, I got an email asking for applications from ISU alumni for the MDRS mission. Ever the optimist, I threw my name into the hat, hoping to get a support position for the main crew. As this was my first direct involvement with the MDRS, I didn’t expect to be chosen for the primary crew. That’s exactly what happened, and I was chosen as a back up crew member and began helping with the planning of the MDRS 188 mission. As fate would have it, A primary crew member was unable to make the commitment, and had to drop out. NASA needed his attention, and I got his spot. It never hurts to throw your name in the hat, you never know what will happen. Discrediting reporters is more important to Blasie Boehmer than the truth. His words are very clear. He wants his supporters to believe that the NDP is removing history, especially Canadian military history, from the curriculum. That’s exactly what Janet French said, and what Mr Boehmer denies happened. For the record, here is the Draft Outline. It is a high level document that lists desired learning outcomes, rather than specific programs of study. It’s the standard way the Albertan Government outlines educational material. For example, to understand “Stories of place and knowing the land and how it sustains us foster a sense of belonging and personal and collective responsibility to be stewards of the land” Grade 10 students will explore the theme of “To what extent do perspectives on relationships with the land influence resource use and approaches to development?” You can use all sorts of current and historic examples to explore this topic. In no way does this outline suggest schools stop teaching history. The current political play book is to lie to the public’s face, and hope we don’t notice. Recently, I finished reading the last book in the Wheel of Time series. While walking home, I saw a copy of the book in a Free Library on my street and picked it up. I was reminded that I hadn’t yet finished the last book, and felt an immediate compulsion to do so. I read the first book over 18 years ago, while on a student exchange in Japan. The book was a gift, and I brought it with me across the ocean tucked in my luggage. Doing so was costly, as I had to give up precious clothing space. Being 16 and on my own in Japan had a profound effect on me, and so did the first book of the series, The Eye of The World. The story is an epic high fantasy with hundreds of characters, different cultures, unique creatures, and a world incredibly rich in details. The books have over 10,000 pages in total, containing more that 4 million words. The first book was published in 1990 but sadly the author didn’t live to finish the series. Robert Jordan died in 2007, but left an extensive set of notes so the books could be finished. The Wheel of Time turns, and Ages come and pass, leaving memories that become legend. Legend fades to myth, and even myth is long forgotten when the Age that gave it birth comes again. In one Age, called the Third Age by some, an Age yet to come, and Age long past, a wind rose in the Mountains of Mist. The wind was not the beginning. There are neither beginnings nor endings to the turning of the Wheel of time. The Wheel of Time deals with cycles. Death and rebirth, the balance of light and dark, the internal struggle we all deal with day to day. The theme of a beginning rather than the beginning is pervasive and repeated over and over. There are no endings, and never will be endings, to the tuning of the Wheel of Time. But it was an ending. In 4 million words, this was the first time an ending was explicitly mentioned. On the last sentence, on the last page, of the last book with the author long dead. When I think about that, I’m filled with loss and hope at the same time. It seems to me this is exactly what the author was trying to convey the entire time.